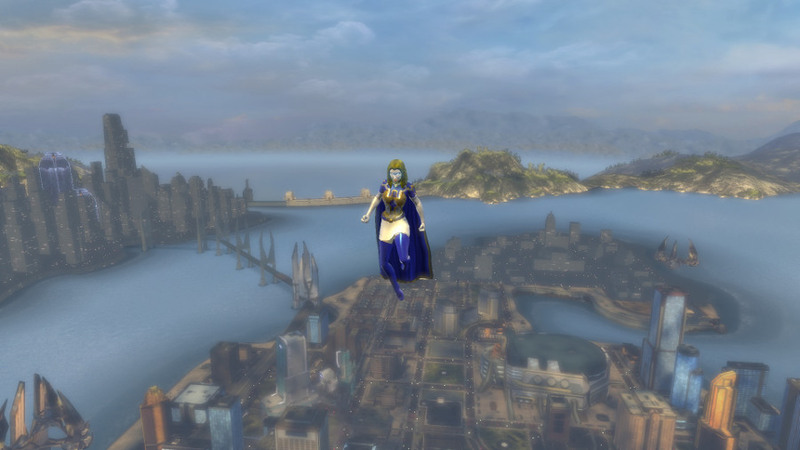 I finally decided to take the plunge and give the now-free-to-play DC Universe Online a try. Right up front, it's kind of a culture shock, because I've only ever played two MMO's, City of Heroes/Villains and Champions Online. Not only are both superhero MMO's, which have major differences from fantasy-based MMO's from what I hear, but both were designed by basically the same people, which means both games are very similar in their design philosophy, mission design, character design, power design, villain groups, etc. But DCUO is a very different animal. It was designed to work as both a PC game and a console game, for one thing, so the control schemes and on-screen graphics owe a lot more to console games than other MMO's. There are key combos for special moves, and combo hit counters, and very simplified power controls. But the game is absolutely gorgeous. The avatar costume designs are not as customizable as Champions or City of Heroes, but every available costume piece seems to work pretty well with every other available costume piece. The attention to detail in the visual design is incredible. That's my first character, Mr Contingency, on a Gotham rooftop. Of course, since this is a DC game, the two big locations are Gotham and Metropolis. 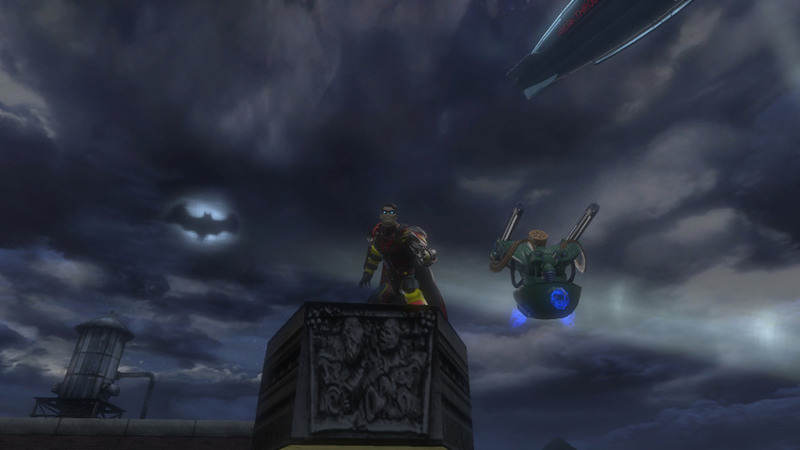 And unlike the other games I've played, which had accelerated day/night cycles, DCUO has none. It is always night in Gotham, while in Metropolis, it is always day. That's my second character, Ms Crush hovering over Metropolis, showing just how high you can fly and good the distance rendering is. Jim Lee was supposedly deeply involved in the visual design of the game, which means everything has a lot of flair, but for an old-school fan like me, I don't always appreciate the Image-Comics-meets-DC aesthetic. The DCUO website also brags about having missions written by DC star writers like Geoff Johns and Marv Wolfman. However, while I think a lot of the missions are fun, there is one aspect to most of them that I'm starting to find tiresome bordering on ludicrous. Missions are designed in arcs--you fight several linked missions in the open world, and then are sent to an instanced mission for the boss fight (if you don't know, "instanced" means the game creates a special map just for you and/or your team--you and another player could go through the same entrance at the same time, and if you aren't teamed up, end up fighting solo in separate "instances" of the same map). But just about every boss mission, with only one or two exceptions, has you fighting other heroes. They might be hallucinations of the Batman family created by Scarecrow's fear gas, or illusions created by Dr. Psycho, or they may be robot duplicates, but usually they're just possessed and/or mind-controlled. In one, you fight the Teen Titans one by one, who are mind-controlled by Raven, who is in turn possessed by her evil demon-father Trigon. In another, you fight Aquaman, who is mind-controlled by the sorceress Circe. Robin is pheromonally controlled by Poison Ivy. Eclipso possesses the Spectre, Green Arrow and Green Lantern in turn. It gets pretty silly after a while.